The most important part of a Solar PV System are the panels. Cheap panels are naturally attractive, however they are unlikely to generate the same amount of power as a higher end quality product. In addition, cheaper panels will likely not last as long and a structural warranty might be worthless if the manufacturer stops selling into Australia. You should only invest in Solar once, so fit the best you can, payback will be far shorter, then you will have free power for years to come. At CDA we only supply quality panels that are high performing and have rock-solid warranties, that's why we pride ourselves in being an LG solar module dealer. LG is a global electronics giant and a leader in Solar technology. LG has been in solar research since the mid 1980s. Module production started in 2009 and current capacity is 1,2 GW with plans for 4 Gigawatt capacity within the next 2-3 years. In 2017, capacity will reach 2 GW. With a huge presence in Australia you have the guarantee that your warranty will be rock-solid. LG panels are all high performing Monorcystalline construction and now have 2 variants, their NeON2 and their new NeON R.
LG solar panels are manufactured in a fully automated manufacturing facility in Gumi, South Korea and come with a 25 year parts and labour product warranty and 25 year performance warranty held here in Australia by LG Electronics. The LG NeON2 modules with their bi-facial cells and CELLO technology absorb light from the front and the back of the module. The solar panel of the future available today. With great low light and excellent high temperature performance, double sided cell technology and 12 wire busbars.. This technology sets a new standard for innovation. Q Cells are a high quality brand, once German but now owned by the Korean Hanwha Group. Q Cells have been in Australia since 2009 and have supplied over 450MW of solar to date. 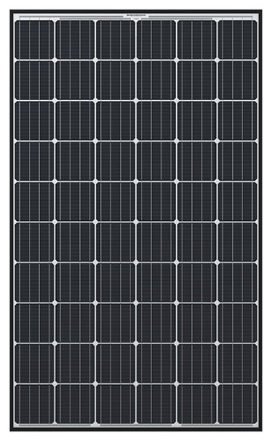 We currently offer the Q Cells Q.Peak-G4.1 high quality Monocrystalline 310 watt panel manufactured in Korea. This particular panel boasts an 18.9% efficiency and a 12-year fully inclusive product warranty.